Every summer since 2012, Brussels Airlines flies the world to Tomorrowland, the world’s most magical music festival. Each year young people from over 200 countries come together for an unforgettable weekend and friendship without borders. 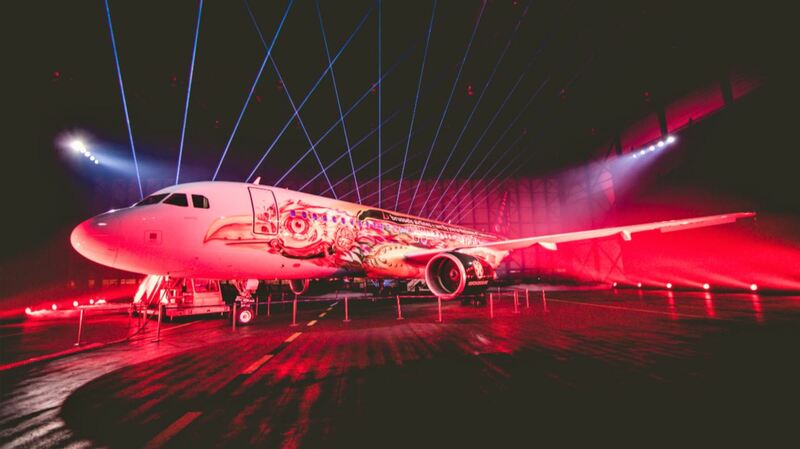 To symbolize this, Brussels Airlines and Tomorrowland created Amare, the fourth aircraft in the airline’s Belgian Icons series. In 2012 Brussels Airlines and Tomorrowland started a Global Journey flying in thousands of young people from all over the world to Belgium, not only to enjoy the festival but also to discover the rest of the country. In the summer of 2016 Brussels Airlines flew more than 10,000 People of Tomorrow to Brussels on 108 special Tomorrowland flights. Now, five years after the first cooperation Brussels Airlines introduces Amare, the airplane that will bring people together all over Europe. It took nine months to finish the creation of Amare. After an intensive period of sketches, 3D drawings and model building, the design was ready for painting. 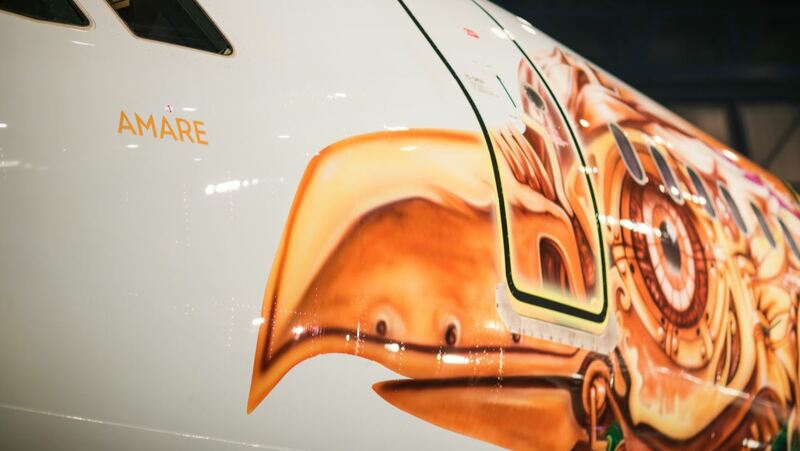 Eight artists worked non-stop for two weeks to airbrush the impressive print onto the Airbus A320. 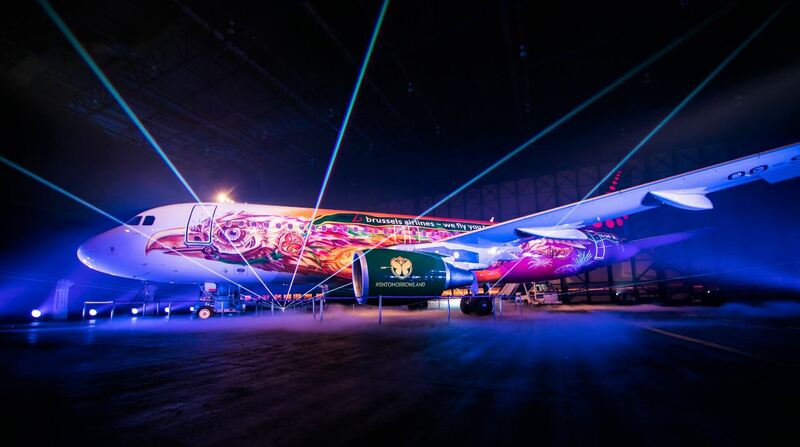 First a gigantic print of the design was created, before being copied onto the airplane, a 37.56 metres long and 11 metres high Airbus, with registration number OO-SNF. After this process, the colours were mixed and the aircraft was painted by hand. 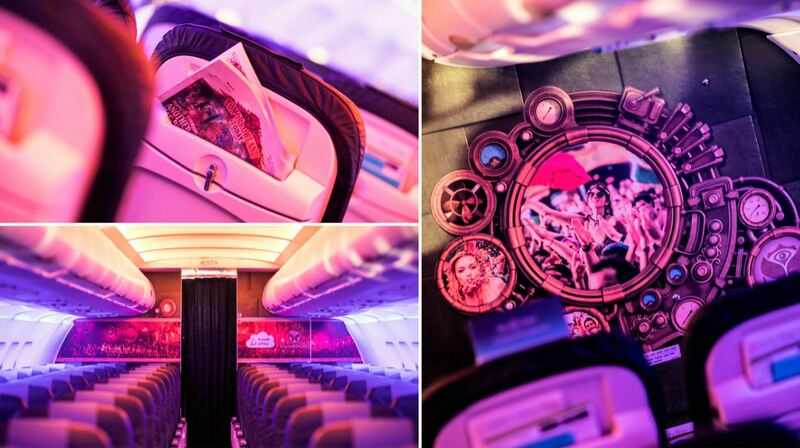 In order to make flying with Amare a complete experience, special mood lighting is foreseen in the aircraft cabin. To get everyone in the right atmosphere, the Tomorrowland Hymn by Hans Zimmer is played every time travellers board Amare. Amare is the fourth special livery plane that Brussels Airlines adds to its Belgian Icons series. As an ambassador for Belgium, the airline wants to bring the best of Belgium to the world. In 2014 the company decided to create Rackham an aircraft dedicated to Tintin. One year later two Belgian Icons were unveiled to the public: Magritte, dedicated to surrealist painter René Magritte, and Trident, the aircraft of the Belgian Red Devils, the Belgian national football team. With Amare, Brussels Airlines now pays tribute to Tomorrowland, which has in fact become a true Belgian Icon. Starting 24 February 2017, Amare is set to bring people from all over Europe together until 2022. Pictures courtesy of Brussels Airlines.